Christmas seems to have pounced upon us from a very warm mild place and suddenly I am desperately wrapping, ribboning and checking that I haven’t left anyone out. I have been perusing the pages to see what food inspired gifts I have missed in my shopping this year and did my usual rounds of the department stores who are in their element at this time of year. You can really understand why they are destination shopping emporiums. Where Selfridges and Fortnums inspire, so Liberty was a difficult place to shop this year. But it is worth noting that there were deals to be had everywhere if you were prepared to wait. Note to self: hold out for the Selfridges 20% off day in 2014! As for the independents, some continue to just do a wonderful job. Clearly my friends at Melrose and Morgan are a destination shop for treats galore with the most impressive bakery range of biscuits and cakes. 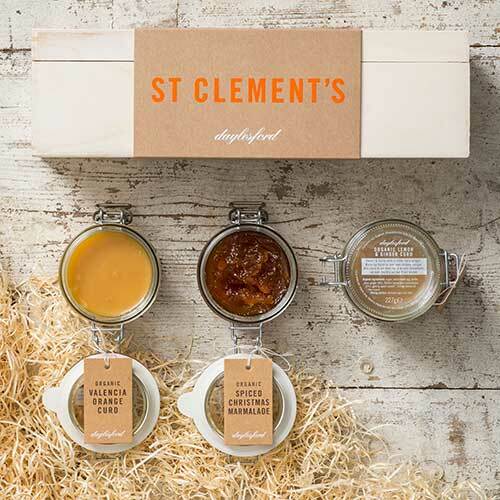 I also thought that Daylesford managed their gift boxes very well this year. 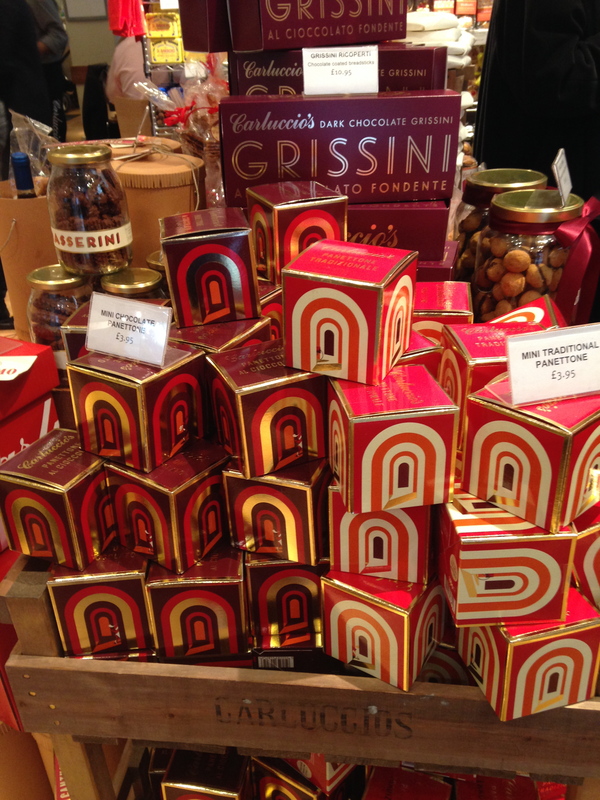 I know it’s not fashionable to say this, but I loved Carluccio’s as well, with their lovely panettone packaging and that grown up Terry’s chocolate orange: Clemente in Camicia. For something a bit more unusual, visit Brindisa, the new Maille shop in Piccadilly and here’s one from my Master of Wine expert friend: Hedonism Wines in Davies Street…amazing. 2. 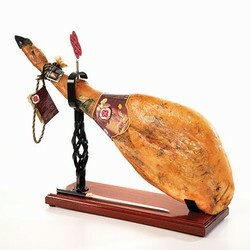 Brindisa’s Iberico Bellota Pequeno Ham set £380. I know a friend of mine has bought this for her hubby and I am very jealous. How perfect. a whole bellota ham complete with stand, knife and a DVD to show you how to carve! 3. The Wonderbag £59.99. This eco friendly cooking utensil is the creation of South African Sarah Collins. It reminded me of the street food we had in Peru and I am sure it harks back to the way our third world ancestors cooked. Now the latest trendy green must have in the kitchen, it is the perfect present as we hit the winter season for wonderful slow cooked meals. And, for every one we buy, Ms Collins donates one to a family in need in Africa. What a lady! No wonder she was named one of Fortune’s most powerful women entrepreneurs 2013. 1. 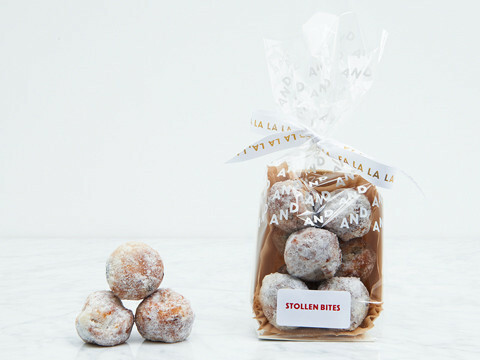 Stollen Bites from Melrose and Morgan. Well frankly anything from here so why stop there. 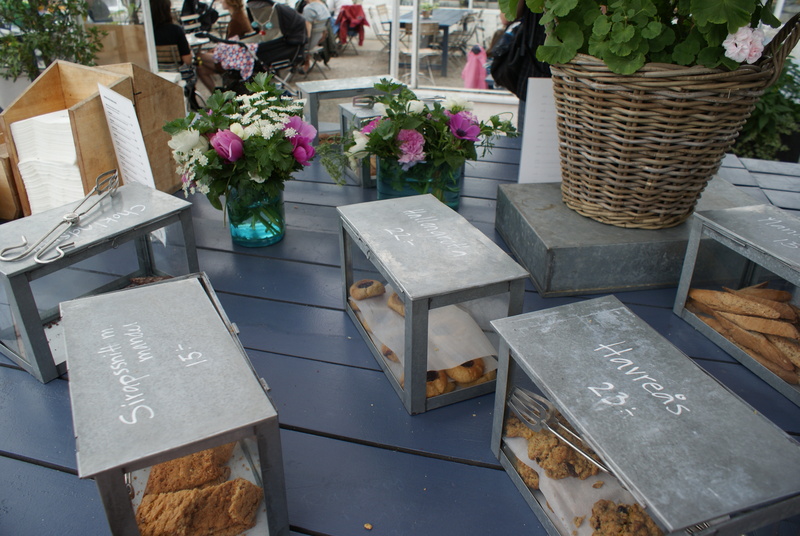 The biscuit range, cakes, puds, savoury biscuits…I could go one. 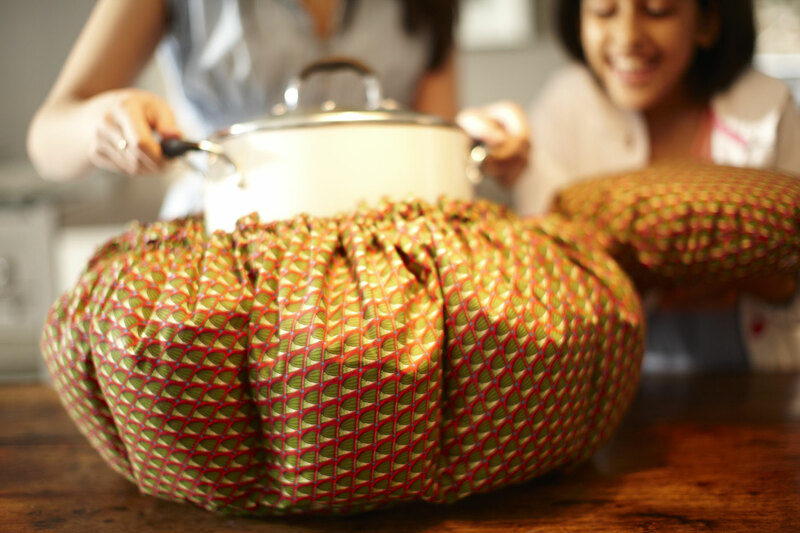 All wrapped in their own elegant, inimitable style and ideal for Christmas gift giving. 2. Kenspeckle cinder toffee coal may have sold out now, but they are worth noting for the future. 3. 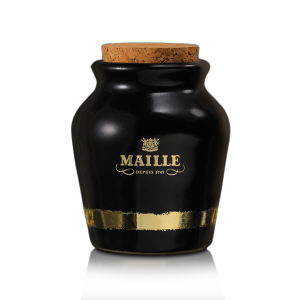 Maille mustard pots which make the most wonderful gift. You can splash out in the Sauternes or Chablis & black truffle variety or keep it simple. Up to you. 4. Amelia Rope chocolate cubes. Created last year, but still so relevant with bite sized treats of all her award winning flavours. 5. Selfridges bombes: more chocolate but a cute design and great stocking filler. 2. 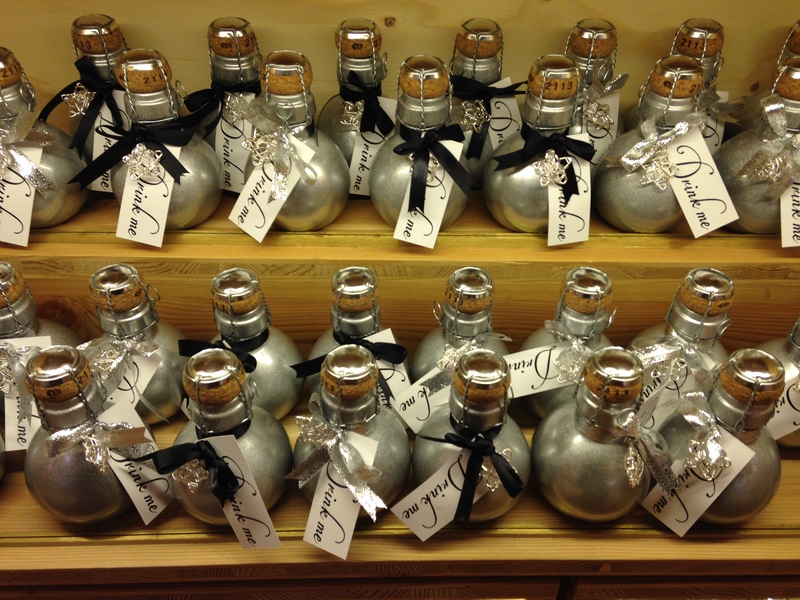 Grays and Feather ‘drink me‘ mini bottles are a must have – so cute! 3. Taster boxes: both whisky and gin feature heavily this year at places like Masters of Malt, and Compass Box Whisky Company. 4. For something completely different, how about renting a row of St Emilion Grand Cru vines. This £159.97 experience from Vintage Wine Gifts includes wine, accessories and a personal tour of the vineyard. And the prize for just the best product I have seen this year goes to … Asda (!) 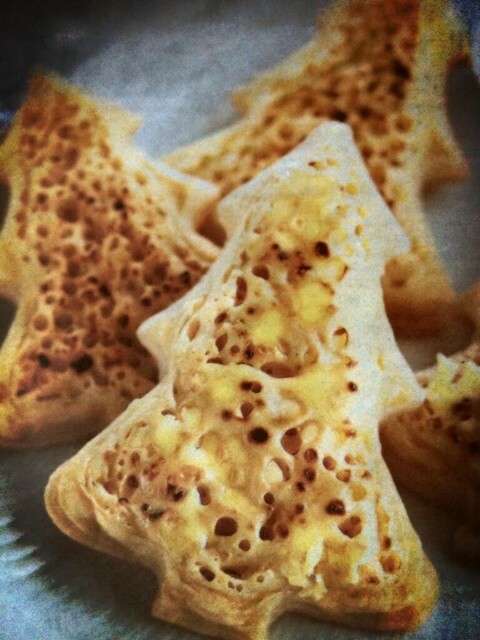 for their Christmas tree crumpets. 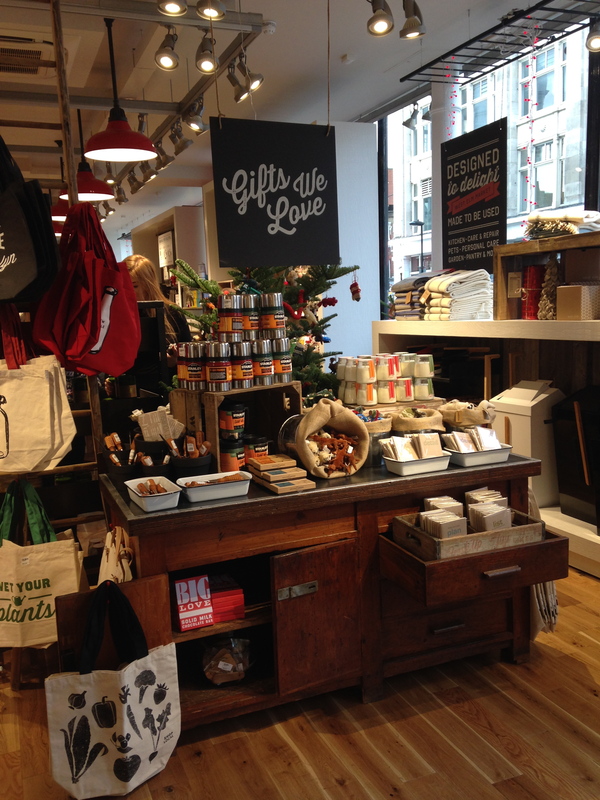 West Elm opened it’s first UK site today in Tottenham Court Road. 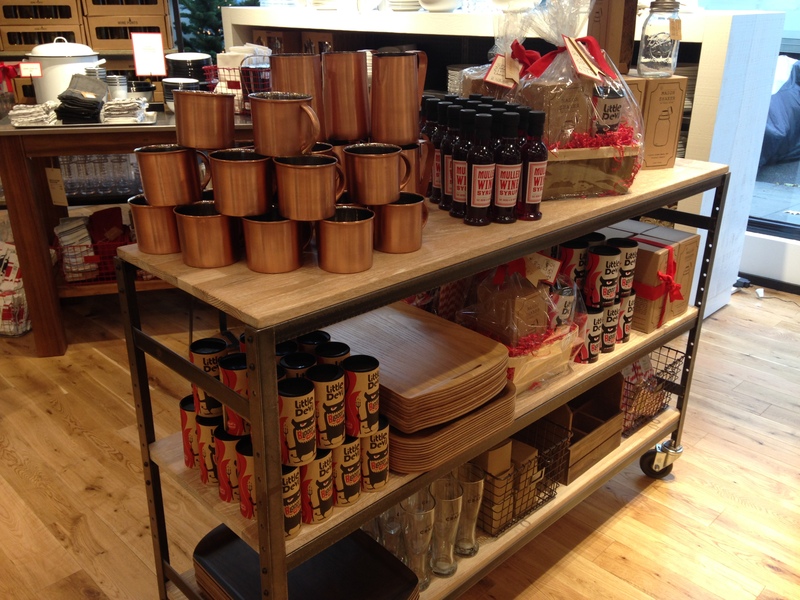 I have to admit that I have not shopped a West Elm in the US but I am a huge fan of their owners Williams Sonoma and there is clearly a standard and attention to detail that permeates the whole company. The first thing you recognise is the difference in the staff attitude and approach. There were loads of excess teams there as you would expect on opening day but what was lovely was the interaction they had with the customer. 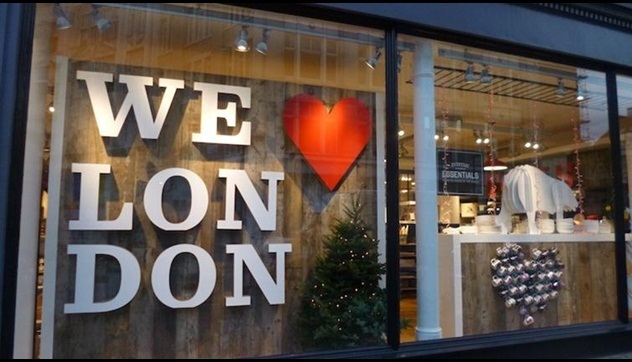 It was one of genuine excitement to be opening here in the furniture/homewares heartland of London and also a clear understanding of soft selling. The other element that translates so competitively from the US model is their ability to catalogue and visually merchandise. They manage to combine these two elements to create wonderful stories which are stimulating and enjoyable to shop. 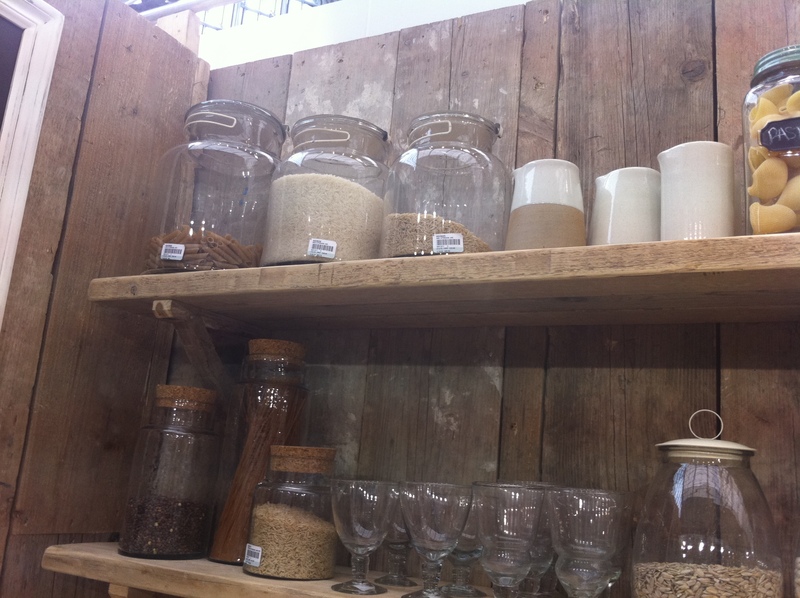 Every corner has something to discover and whilst some product is familiar to me, lots is new and interesting. They are also pretty competitive price wise at the mid level range with clear intro key prices as well as some at the luxury end. In support of all this is a great tone of voice that fits their brand well keeping signage and communication something simple that makes you smile. 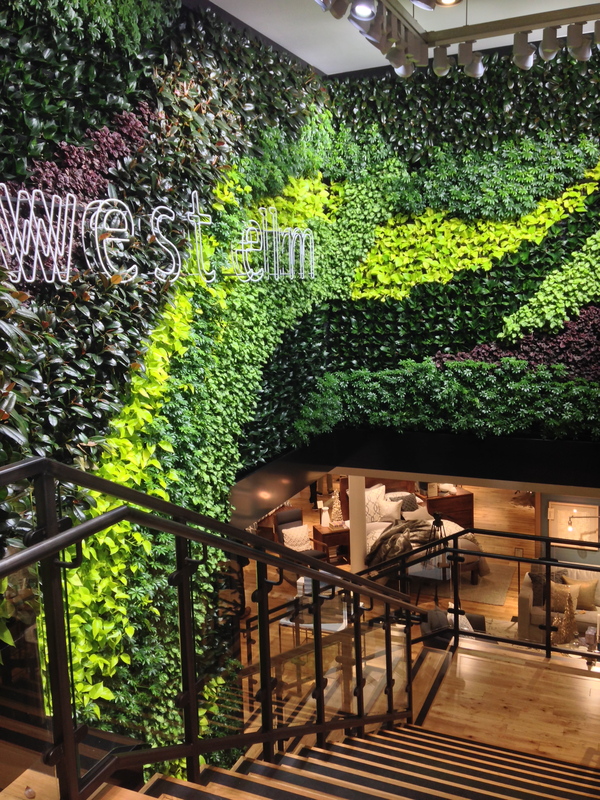 At the centre of the shop is a living wall which is something that has been done many times before, but it is still attractive. It adds colour, vibrancy and a sense of outdoor space which helps to define a relaxed tone within. The natural wall wraps around the central staircase which leads downstairs to a more conventional home floor but with nice room sets and an ordering zone which was very efficient when I put it to the test. The fun zone upstairs is their market area which has a funky coffee shop, a mixture of kitchenware and food plus some well thought out toiletries. Studded throughout the whole ground floor were little highlights which showed product combinations and stimulated nice ideas to enable visualisation of the product in a home environment. 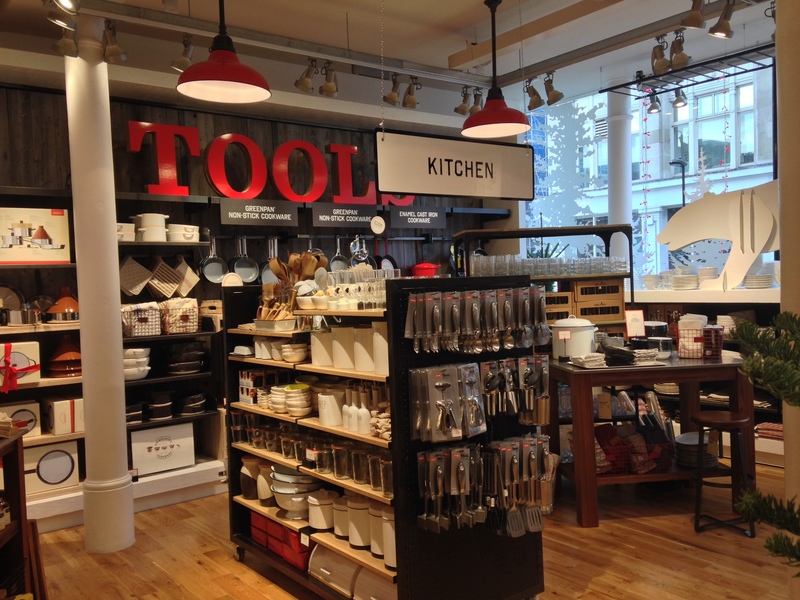 It will be interesting to see how this first foray goes for the Williams Sonoma team. I believe they are looking at other sites for their other brand – Pottery Barn. I personally think it is a welcome addition to the UK high street and I wish them well. 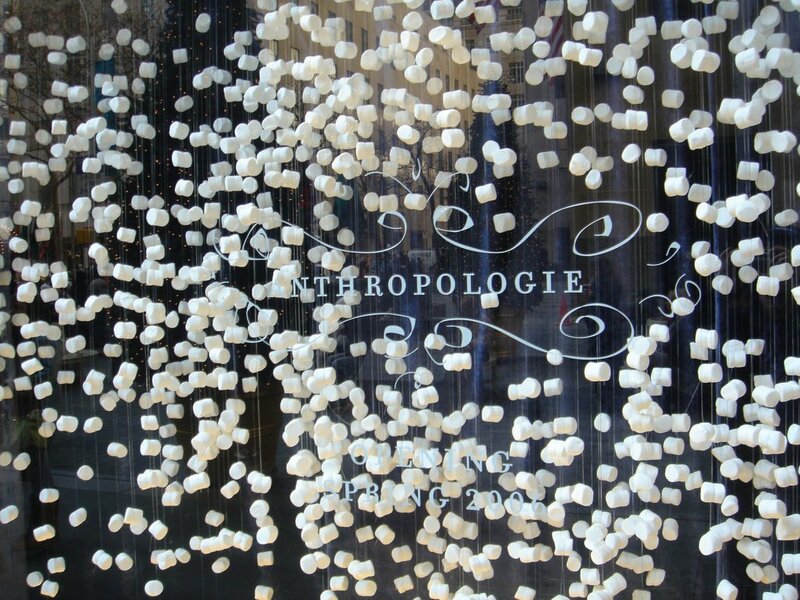 I always think that the best retail experiences are created primarily through great visual merchandising. In the retail industry, there are many fashion and home stores that really can deliver that wow factor from the first window right through the store. The shop that immediately comes to mind as the best example of this is Anthropologie. 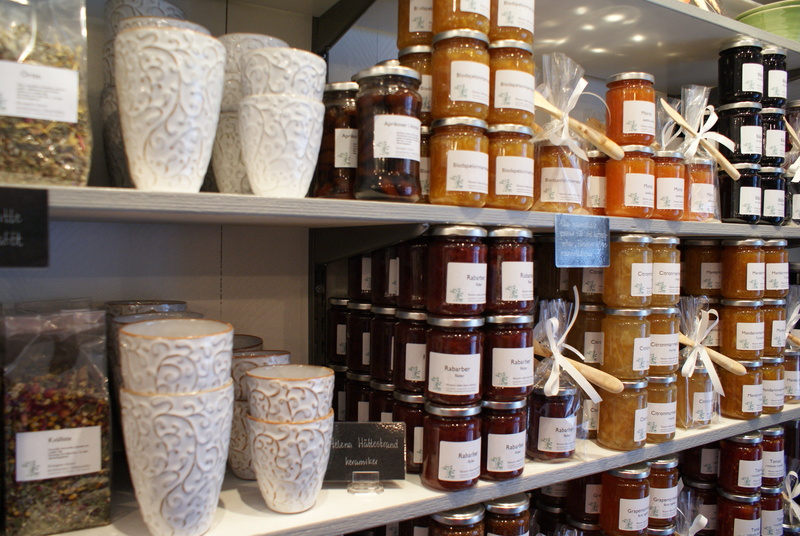 But in food, there is less style and it is very hard to maintain a sense of interest throughout the shop. Many would say that Eataly is the answer in food, but for me they capture it in places and not in others. It can be cold, in some of the Italian versions and cluttered in NYC. Yes, it is a great start but not one that can’t be bettered. The place that did it for me was Rosendals Tradgard in Stockholm. This botanical garden had a unique style and elegance that translated into their small shop encapsulating the brand perfectly. Clever use of unusual items were there to display goods, food was kept simple yet different and the overall effect was one that had me going back and back. It really did gel the brand values with the customer experience. One to visit, for sure. Now I am trying to create a food store that does the same for the company I am working for. No pressure! I can be as critical as I like but now I have to put my money where my mouth is and do it for real. So this week I ventured to a trade show that would fill in the visual merchandising gaps that were left from the food fair last week. 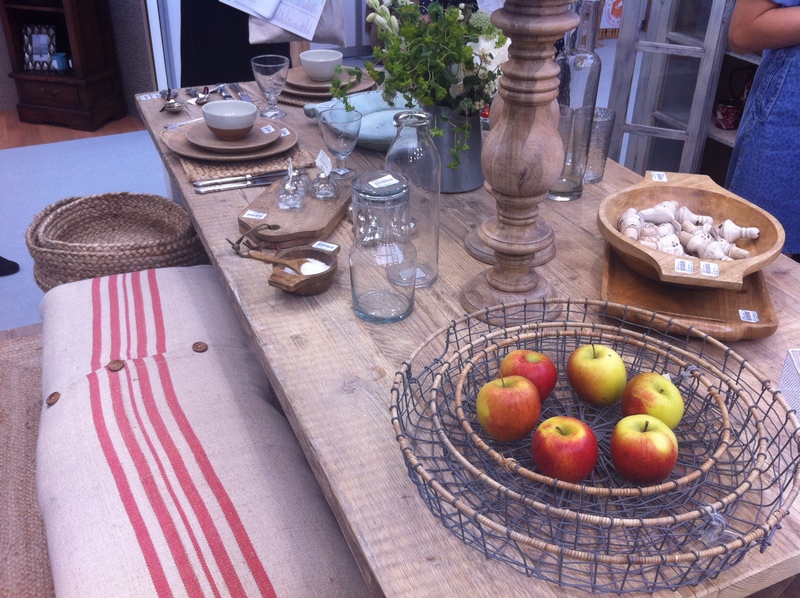 Top Drawer is one of the best shows for me to find what I am looking for. It has a standard of trader that is at the right level and if you open your imagination, then all sorts of things are up for grabs. Nkuku is a great place to start. It is an eco friendly, fairtrade gift and home supplier sourcing primarily from Africa and India, although they tell me they are expanding into Morocco and the Far East more this year. I was drawn to it, not just because it is my natural taste, but also because it is organic, honest and simple, reflecting a lot of the brand values that exist on the farm. It will be essential to cherry pick, there is no doubt, and sometimes surprise, but I could really begin to piece things together standing there on that stand. I bet your first thought was not perfect box for displaying biltong when you saw this?! Hop & Peck is a company I earmarked way back last Spring and it was lovely to be reminded again how great these guys are. 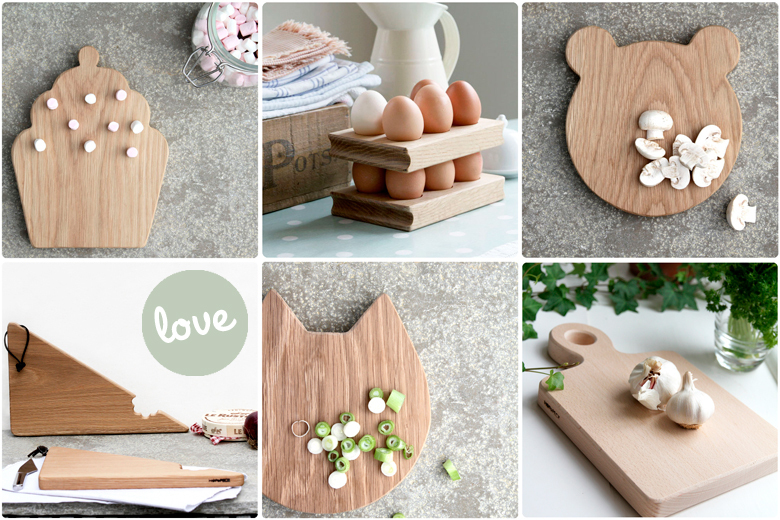 Their hand made British homewares match traditional Oak with fun modern designs to being something just a little bit different to the home market. I can see us cross merchandising these into our different sections to add interest and novelty. 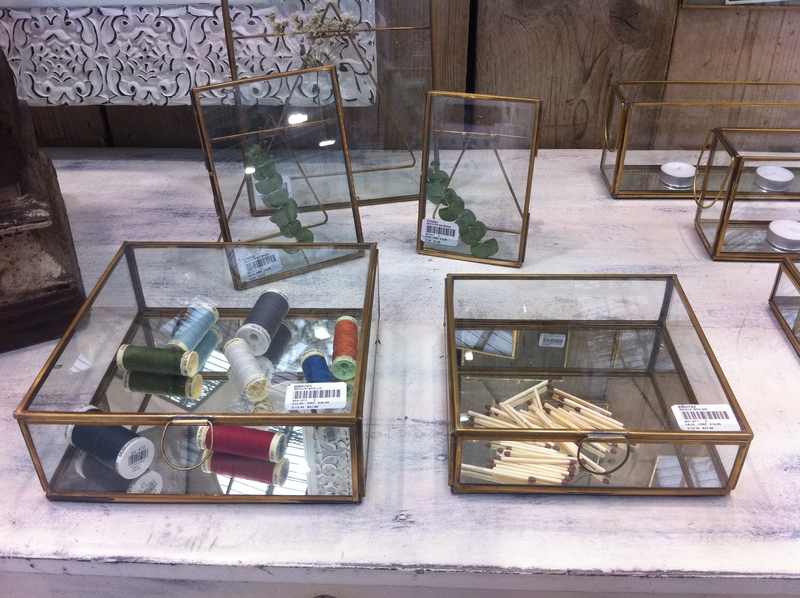 It was great to see them win the Top Drawer best new gift product award at the show as well. Much deserved. I always thought I had an eye for the expensive, but apparently it is the award winners too as I had spotted the best new wellbeing product too, even thought I was only passing through the wellbeing section. 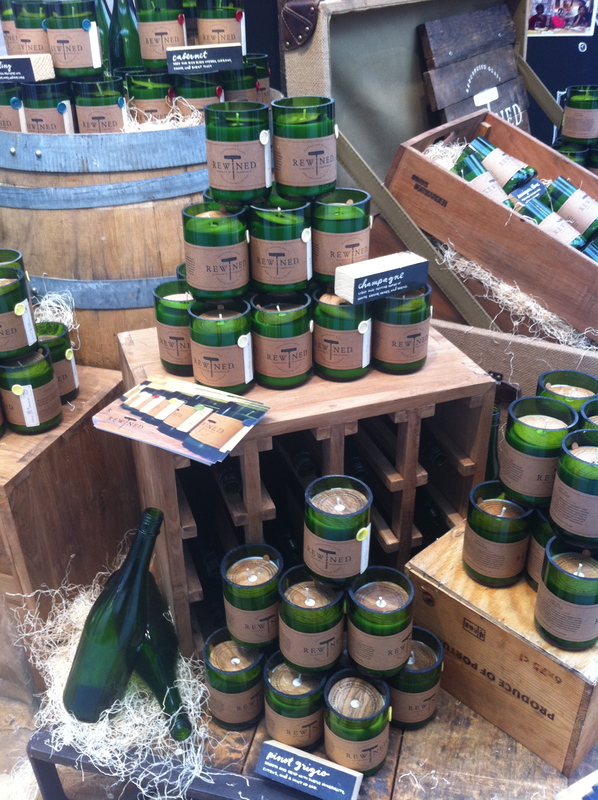 Rewined Candles are American soy candles made in Charleston from recycled wine bottles. The fragrances nod to the notes of the individual wines. They really are something new and now available in the UK. Lots of hares which had clearly been jugged! After all that VM speculation it was great to meet friends later on to pursue our quest to find a great Sunday lunch. We are working our way through a list of so called great places which normally underwhelm but our hopes were high when we arrived at the Jugged Hare. With my creative hat on, it was great to see somewhere embrace their theme without it appearing like DisneyWorld. 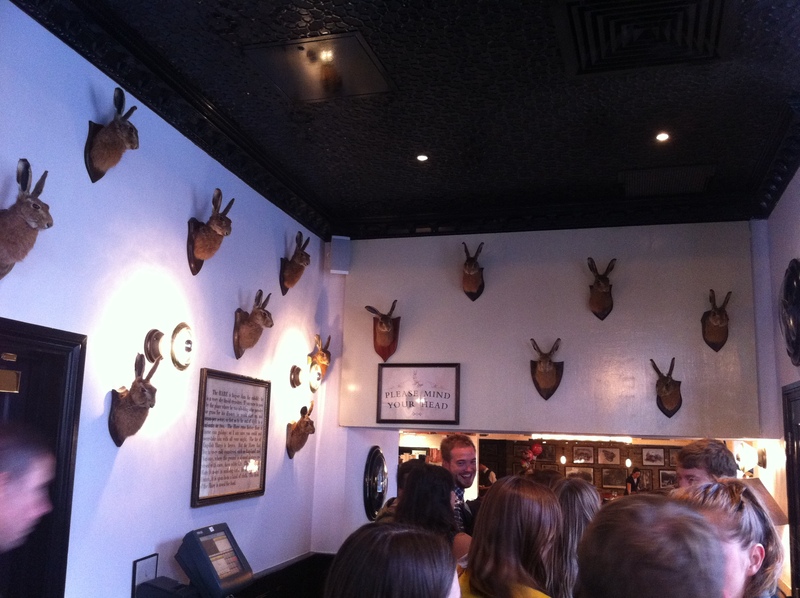 Maybe it was the harsh reality of all those animal and bird heads on display, but we all agreed that we liked what they had done with the place. 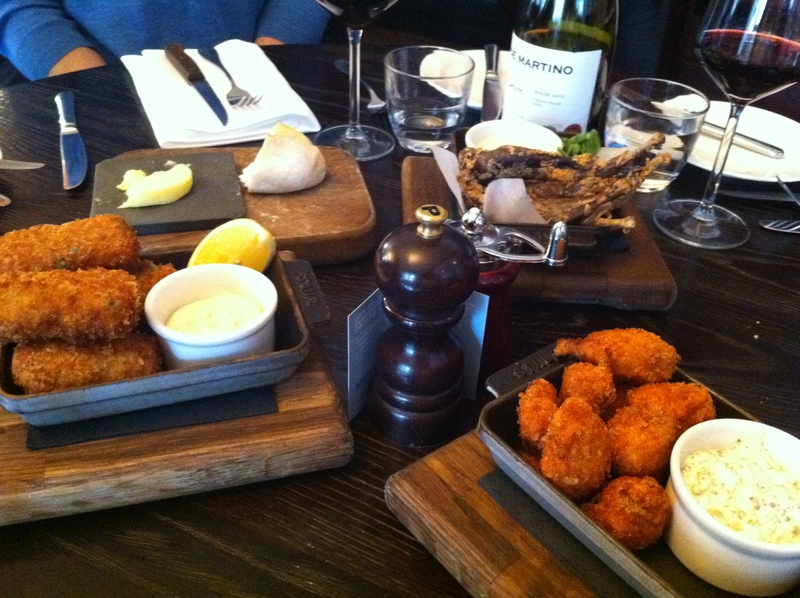 The food got off to a good start too as we shared kedgeree croquettes, breaded skate knobs with a fabulous tartar sauce and the very in season grouse legs which smelled (and tasted) of horse manure! Lovely. But sadly our journey continues as the mains didn’t come up to scratch. The meat was lovely, but veg woefully under-done. Shame. The lovely lady serving was a fine example of how to handle our disgruntled bunch but after so much promise I can’t see us rushing back. 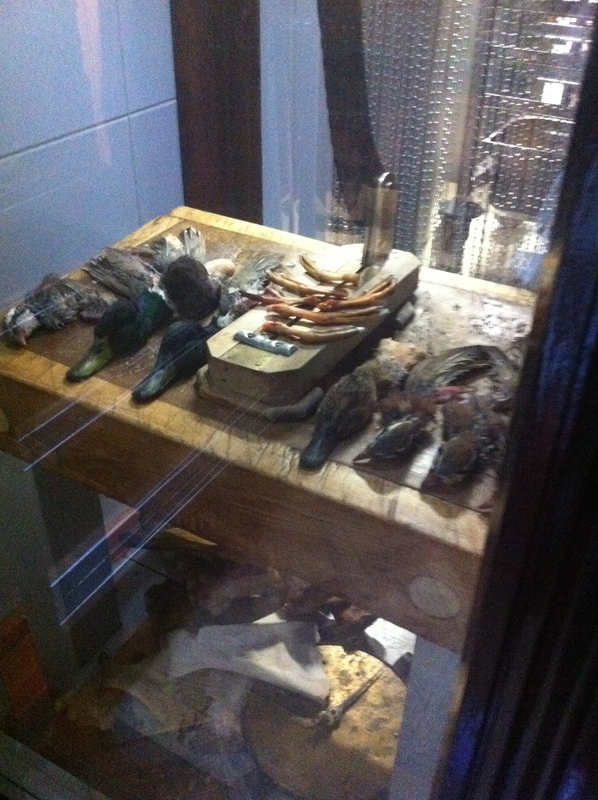 So I leave you with a few birds that hopefully didn’t lose their lives in vain – displayed on the way to the loo. Let’s hope their dishes were more rewarding to whoever ate them. Sometimes I do have to wonder about the sanity of marketing. Don’t get me wrong. I love the fact that I am a marketer and really do enjoy coming up with new and interesting communication and promotional ideas especially in this era of social media but I fear the pressure to come up with different ideas to capture the young media savvy market is pushing a few corporate teams into losing their marbles. Take Heinz beans. They are expanding their range to include a 5 bean tin with more varieties of bean in their yummy sauce. 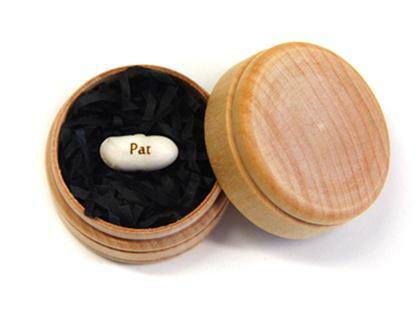 The new campaign includes the chance to have your name engraved on a bean…..really?!?! Is it just me or is that idea not just plain daft? Who wants a bean with their name engraved on it? even if it does come in a nice box. I am sure that their social media team thought this was a great idea when they were sitting in their studio brainstorming ways to build Facebook into the campaign but isn’t this just ideas gone mad? 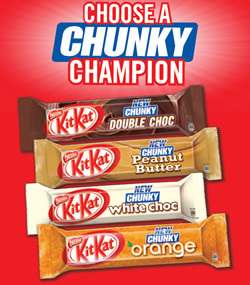 In January this year, Kit Kat launched a Facebook competition in their “Choose a Chunky Champion” campaign to figure out which new flavour to add to their range and this really did hit the mark for that particular medium. Each flavour had its own personality created by a specific comedian and the whole campaign was well integrated and incentivised across all media. The result was over half a million responses for this cleverly created campaign which was really only glorified market research. And the winner was … peanut butter. 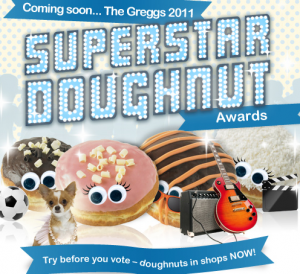 Greggs the Bakers kind of started it with last year’s Superstar Doughnuts Awards, creating an X Factor style campaign across You Tube, Twitter and Facebook. Once again, each flavour had its own personality and for me, this was a team who really understood social media and had some fun with it all. Digital specialists Steel came up with the campaign saying “it’s not advertising… it’s social entertainment” and the results speak for themselves. Not the fact that “Glam Rock Legend” Jaffa Cake won, but the commercial success that drove bottom line profit. Within the first 5 weeks of the campaign, they sold over 1.4 million doughnuts giving their standard jam doughnut a run for its money. That works out on average at 40,000 doughnuts a day or something like 3200 an hour! 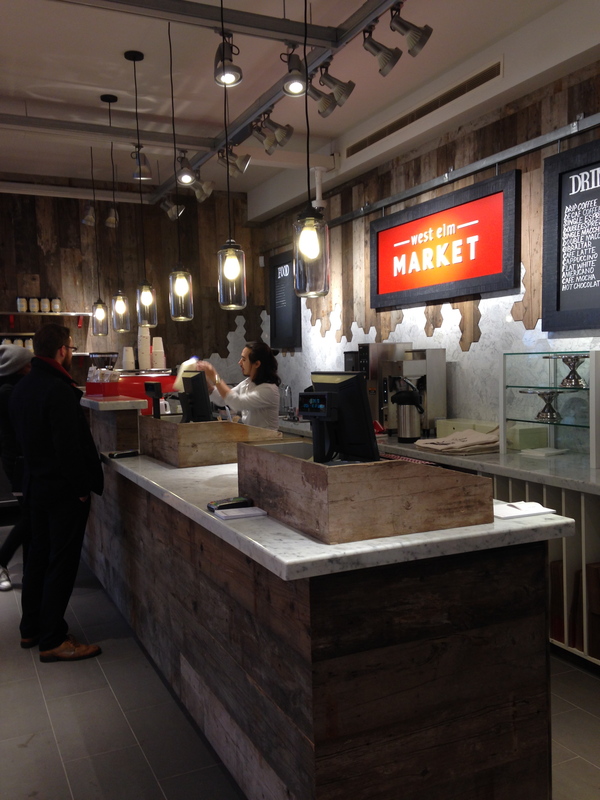 This campaign, along with some new store openings, were announced as the reason that Greggs posted such great sales results last October at a time when most other high street food companies were struggling to show any growth at all. So it can be done, but only where the creative is fun, the concept connects with the zeitgeist, the product development is there and the product gets its own personality….and that doesn’t mean putting a name on a bean.